(Sugar Land, Texas, Feb. 8, 2017) – The Sugar Land Skeeters announced today that the club has re-signed outfielder and former big leaguer Rene Tosoni to its 2017 roster. 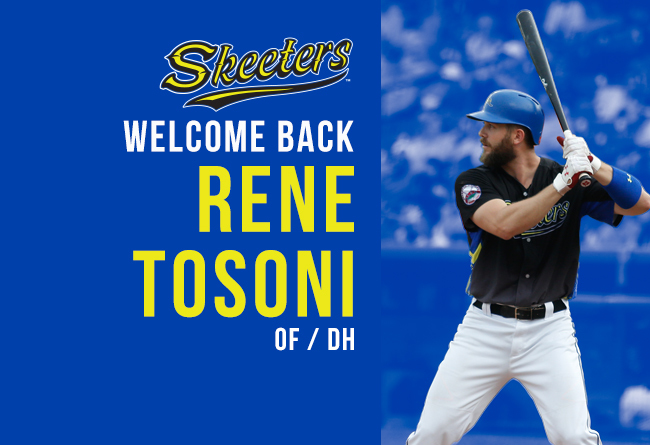 Tosoni, 30, returns to the Skeeters for his second straight season and third overall, bringing eleven years of professional baseball playing experience to the team. Last season Tosoni primarily spent time as an outfielder, batting .301 and leading the league with 12 triples, setting a new Skeeters single season record. He also played a significant role in the Skeeters winning their first Atlantic League championship last season. After trailing 7-0 against York in game two of the Freedom Division Series, the Skeeters rallied in the fifth inning to take an 8-7 lead, only to once again fall behind 9-8 in the seventh. However, Tosoni’s two-run homer in the bottom of the eighth solidified a 10-9 win for the Skeeters and a 2-0 lead in the best-of-five series. The club ultimately went undefeated in the playoffs (6-0) and 10-0 down the stretch to capture the first championship in franchise history. Last season was the second time Tosoni helped the Skeeters reach the Atlantic League Championship round since his acquisition in 2014. Tosoni was originally drafted by the Minnesota Twins in 2005 and spent seven seasons in the club’s minor league system. While with the New Britain Rock Cats in 2009, he was elected to participate for the World Team at the All-Star Futures Game, where he earned the game’s MVP honors. He made his MLB debut with the Twins in 2011 and batted .203 with 5 home runs and 22 RBI in 60 games. Tosoni, a native Canadian, won a bronze medal with Team Canada in the 2009 Baseball World Cup and a gold medal with Team Canada in the 2015 Pan Am Games. He also played for Team Canada in the 2013 World Baseball Classic. Opening Day for the Skeeters’ 2017 season is set for Thursday, April 20 at Constellation Field when they host the Bridgeport Bluefish in a 7:05 PM game. Season tickets, mini plans and flex books are on sale now at the TDECU Ticket Office or online at www.sugarlandskeeters.com.